The examination of valvular heart disease includes the assessment of valvular morphology, cardiac output, intracardiac pressures, ventricular volume and volume regurgitations. Magnetic resonance imaging (MRI) is potentially the most appropriate technique for addressing all of these areas in a single examination. We have previously implemented an MRI subsystem that seamlessly integrates most of the capabilities needed for a comprehensive valve evaluation . This includes the evaluation of aperiodic valve motion (real-time SSFP and GRE), evaluation of valvular morphology (double inversion cardiac gated black blood technique with 16 spiral interleaves), evaluation of valvular regurgitation (real-time color flow phase contrast ) and evaluation of intracardiac flow velocities (real-time velocity spectra (FVE) or MR Doppler [3–6]). For this work, we have expanded this system to include a cardiac gated MR Doppler sequence to improve the resolution and velocity range of our previously demonstrated Real-Time MR Doppler sequence . We have developed a cardiac gated MR Doppler sequence that can be immediately prescribed from the real-time MR Doppler acquisition in cases were higher velocity spectra resolution or dynamic range are required. For both the real-time and the cardiac gated sequences, the system can change waveforms to adjust for the appropriate maximum velocity. In the example, an aortic valve from a healthy volunteer was evaluated. A maximum velocity of +- 200 cm/s was selected (from a range between 100 and 600 cm/s). This resulted in the following parameters for the real-time sequence: 3 interleaves of 6.8 ms readout length and 20 ms TR, 34.8 cm/s velocity resolution, 33 cm Z FOV and 5 mm Z spatial resolution. For the cardiac gated sequence: 8 interleaves of 7.5 ms readout length and 22 ms TR, 12.2 cm/s velocity resolution, 35 cm Z FOV and 6 mm Z spatial resolution. The system was evaluated with a normal volunteer. Starting with real-time anatomical images, the aortic valve was localized. Color-flow was then enabled to assess regurgitation through the valve and to further localize the FVE measurement. Real-time MR Doppler was enabled to measure the velocity spectra distribution. Cardiac gated MR Doppler was then used to obtain a higher resolution velocity waveform. The figure on the bottom left shows the resulting spectra acquired in real-time (Figure 1). The top left image demonstrates the corresponding cardiac gated higher resolution acquisition. The top right image shows a single frame of the position vs. velocity representation where it is possible to observer the velocity gradient through the valve. While this technique suffers from the need for sinus rhythm, the improved accuracy should be helpful for a large number of patients with regular rhythm. 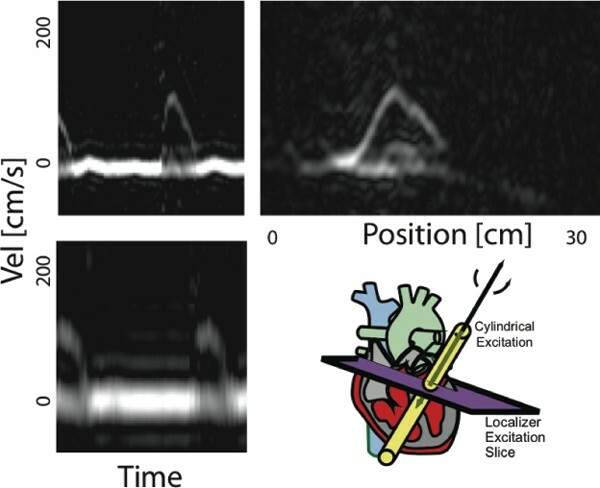 To improve intracardiac flow velocity evaluation using a real-time MR Doppler system, we present a cardiac gated CINE implementation resulting in higher velocity resolution and range. Velocity spectra through the aortic valve measured with real-time FVE (bottom left) and cardiac gated FVE (top).